It’s a new financial year and we have a new 1% Volunteering Team who are working on a new project to help our local community. Firstly, let me introduce our newest volunteer, Emma Jerome, who will be joining Elaine, Jag and Emma B on the team! Emma is part of the MICE team and was recently promoted to Senior MICE Consultant. She’s been with Click for 2 years and in her spare time looks after her flock of chickens! Every fortnight, our team will be going down to Nishkam Help who are based in Handsworth, near Birmingham City Centre. Nishkam Help is part of the Guru Nanak Nishkam Sewak Jatha Temple who cook and distribute food to the homeless regularly. 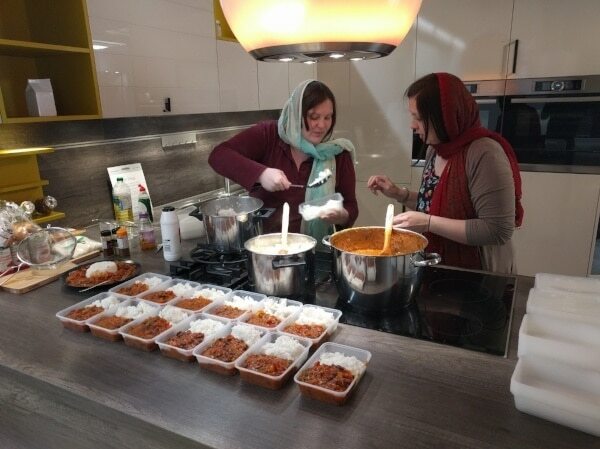 For Click’s first big cook, Elaine provided a vegetable chilli con carne recipe for 35 people! The team then got together to buy and transport the ingredients to the temple. As it was Elaine’s first time cooking chilli con carne she got a chance to have a little taste before the food was distributed. I love to cook so the experience was really enjoyable. It was also nice to know that a lot of people will be able to have a good hearty meal tonight. Our volunteering team are getting organised with a folder of recipes full of nutritious dishes for the next big cooks. If you have a great vegetarian recipe, please feel free to contact us via email or social media! You can also follow Nishkam Help on their Facebook page to keep up to date with their activities and ways to volunteer.